Remarking on how Goodman Games has been an enthusiastic supporter of Free RPG Day since its inception in 2007, they're now proud to present two adventures. Moreover, they've gone overboard on covers with five different designs which were distributed randomly to retailers. Those who download the PDF get to see them all! For Dungeon Crawl Classics RPG there is a Level 1 adventure called The Madhouse Meet, set in the forthcoming Lankhmar campaign setting (yes, the Fritz Leiber one). As a 'meet' adventure, it's designed to start off a campaign in Nehwon by throwing a disparate bunch of player characters together as they attempt to escape the clutches of a bizarre sorcerer from lands far beyond Lankhmar. It's designed for four characters but will work with fewer. After some background explanation for the GM, the adventure begins with our luckless heroes banged up in a cell. Hopefully they'll make a break for freedom... A lot of use is made of Luck, and there's a note to the effect that guile rather than brute strength is often more effective in Nehwon! While a short adventure, it is well written with atmospheric descriptions and plenty of ideas scattered around that could lead to further adventures. It's a good taster for both the Dungeon Crawl Classics RPG and the Lankhmar setting. The other adventure, for the Mutant Crawl Classics RPG, is a 'character funnel' adventure for some 15-20 level 0 characters, with each player running multiple characters. It's called The Museum at the End of Time, and involves a bunch of younglings sent out on a 'Rite of Passage' to survive in the wilderness, retrieve a functioning artefact of the Ancients and, if possible, trigger whatever mutations lurk within their genetic code. This bunch has chosen the high-risk high-stakes option of venturing into the trackless Glow Desert in their quest. After a couple of days and whatever random encounters you throw at them, they arrive a a structure which they can explore and loot. It is not, of course, devoid of defences! There are some wonderous and inventive artefacts to be found, many of which will lead incautious or curious characters into no end of trouble. There's some excellent advice for the GM about presenting artefacts to primitive people who haven't a clue what they are, which will benefit anyone trying to describe items to a party ill-equipped to comprehend them, never mind this adventure. Both are cracking little adventures in their own right, as well as good introductions to their respective systems. There are no rules given here, provided you know the Dungeon Crawl Classics RPG mechanics you will be able to cope. Pre-generated characters for both adventures are available on the Goodman Games website. Enjoy your foray into these settings! 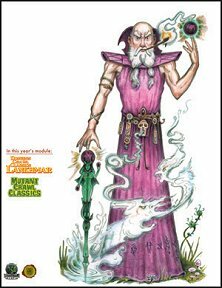 Return to Goodman Games Free RPG Day 2016 Module page.